1 Looking for Underlayment for Vinyl Plank Flooring? 2 Does Vinyl Plank Need Underlayment? 3 What Underlayment Is Made For Luxury Vinyl? 4 What Installation Issues Could Arise With Luxury Vinyl Flooring? Looking for Underlayment for Vinyl Plank Flooring? Does Vinyl Plank Need Underlayment? What Underlayment Is Made For Luxury Vinyl? What Installation Issues Could Arise With Luxury Vinyl Flooring? The answer to this question really depends on you flooring manufacturers installation instructions. Knowing what they require will keep your flooring warranty however if you are looking for sound reduction, then underlayment is ideal to put under vinyl plank. Another article was created going further into detail such as density of underlayment needed for luxury vinyl. 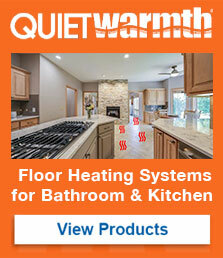 With density in mind, we tweaked the fiber formula from our other popular QuietWalk for laminate flooring. Same benefits as the famous QuietWalk, just thinner/denser which eliminates movement when walking on vinyl plank flooring. MP Global Products introduces SoundBuffer, a high-performing universal underlayment for vinyl plank flooring that offers full subfloor coverage while soothing impact sound and floor to ceiling noise. Its carefully engineered properties enable flooring installers to use one underlayment for many types of hard-surface floors in residential and commercial projects. SoundBuffer can be floated, nailed, stapled, single or double-glued. If single glued, it can turn a double-glue installation into a floating floor. Providing excellent value, the competitively priced Sound Buffer has strong physical properties, including 1.2-millimeter thickness, a density of 25 pounds per cubic foot, and a compression set of 16 percent-a carefully engineered combination that helps minimize impressions and indentations that can occur with luxury vinyl flooring. It also has a thermal resistance of 0.205, and anti-microbial properties. Result: 52 – A rating that exceeds the standard for high-rise installations. SoundBuffer offers a compression (ASTM D 1055-97 (22h, 70C) of 16 percent that works nicely under LVF and, unlike the compression percentage of most underlayments suitable for luxury vinyl flooring, is hearty enough to install under floating wood and laminate floors, as well. SoundBuffer also carries Green Label Plus Certification for Low-Emitting Materials from the Carpet and Rug Institute and can contribute to earning LEED Credit EQ 4.3 (low-emitting materials), LEED Credit MRc5.1-5.2 for Regional Content 20-30 percent; and LEED Credit IEQp3 Minimum Acoustical Performance. And post-consumer use, it is 100 percent recyclable. SoundBuffer is available in 36-inch-wide 200-square-foot rolls, with or without seam tape. To install luxury vinyl properly in any room, the subfloor needs to be prepared. It is vitally important and any irregularities in the subfloor will show through to your floor. High and low ares will show. A dense underlayment like Quiet Walk Luxury Vinyl offers the performance your LVT needs to lie firmly against your subfloor and also hide minor irregularities. PreviousPrevious post:Flooring Installation: Crack Isolation and Sound Control TipsNextNext post:New In-Floor Heat System! Can you glue LVT to QuietWalk Luxury Vinyl? Yes, you can glue this with LVT (Luxury Vinyl Tile).